Dim sum restaurant all decked out for Lunar New Year. Red envelopes hang off the flowering branches. I expected us to head to the usual place in Monterrey Park. But we went to a restaurant in a plaza instead. We were on the ground floor, near a window. The place was packed. As usual, I was the only white person there (fending off the inevitable onslaught of forks) until Engineer Cousin and Chronically Late Cousin showed up with their Caucasian husbands. The cousins also had babies – yes, both of them! It was a bloody baby epidemic. Yee-mah was thrilled, of course. Now she had two granddaughters, and her sister Sunny (my mother-in-law) only had one. Thankfully, with a doting grandmother and grandfather at the table, I did not have to hold the babies. They were adorable, of course, but I’d had my fill of babies years ago. I focused on casually acquiring as many nai wong bao as possible instead. “Always, Yee-mah. Except for chicken feet,” I said, listening to the “plink, plink, plink” of toenails hitting plates around the table. “You not so skinny as when you get married,” Yee-mah observed. Andy turned red, laughed, and stuffed his face with another foot. We all turned and looked. 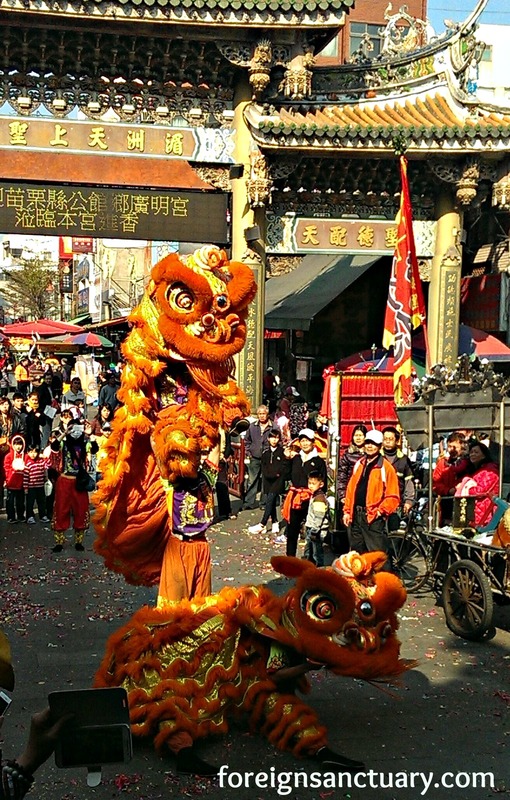 Two lions dancing in Lugang, Taiwan – Courtesy of Foreign Sanctuary. Click for more Lion Dance Pictures! A giant, lush creature of red and gold jumped and danced through the plaza. It took me a minute to figure out it was a puppet worked by two people under an elaborate costume. One carried the head, the other the back end. I looked at the packed restaurant. The customers were on their feet, cheering the Lion Dance. More than a few kids waved around cash and elaborate red envelopes. I looked back out at the lion. The costume was incredibly detailed, down to the eyes that opened and shut. A cadre of drummers in the plaza pounded out a beat that made the table vibrate. Sure enough, the lion’s head had a head of lettuce. Mr. Lion appeared to be eating it. Bits of lettuce were thrown in all directions. Like how the Cookie Monster “eats” cookies on Sesame Street. “You mean the Lion Dance is a kung fu protection racket? !” The Extortionist Lion finished shredding lettuce and pranced over to the restaurant. They grinned, but never answered. I never pressed them, either, because by then Mr. Lion and some drummers were in the restaurant. Yee-mah ran off with Cousin Baby #1. She ran all the way to the lion. Then Yee-mah pulled the baby’s hand out, touched Mr. Lion’s head, and ran back to us. Baby Cousin #1 protested until she was red in the face. Undaunted, Yee-mah swapped Baby Cousin #1 for Baby Cousin #2 and ran off to make sure the other granddaughter also touched the lion. Baby Cousin #2 screamed. As did all the other babies that got dragged over to touch Mr. Lion. Thankfully, the drums were louder than the babies. When Mr. Lion left and the drums subsided, Yee-mah explained that touching the lion would give the babies good luck. Andy didn’t say a word. Another lightbulb went on over my dense white head. Lunar New Year was excellent for epiphanies. “OH! Oh, right, I forgot about that sexist crap. YOUR child would be the first grandchild of a SON, rather than a daughter. And if the baby was a boy…” I gnashed my feminist teeth. Andy, wisely, continued to say nothing. I tried to look on the bright side. Even though we hadn’t brought any red envelopes, we’d given out at least one gift. Yee-mah knew she was still beating her sister in the Chinese Offspring War. Never seen the Lion Dance? Check this out. When you and Andy have a child, make sure it’s a boy and he is born in the year of the Dragon. Ha! I think reproductive science has to come a lot further before we can promise that. How many years until the dragon rolls around again? I am appalled that Andy thinks that Chinese New Year is “no big deal”!!! He cheated his baby cousins out of money! Tsk! p.s. nai wong bao are awesome, but nobody (and I mean nobody) stands between my dad and his jin duei. Or else. Also, happy year of the monkey, Autumn! I know! Chinese New Year is a big deal — there are even school districts in Los Angeles that take today off because so many kids won’t be there. It’s gonna be up to me to insist we celebrate all the holidays. Even the Chinese ones! NYC schools are closed for CNY. I thought it would be the same for schools in LA? It depends on the part of LA County. In the South Bay, Torrance was closed, Redondo was open, as were Hermosa and Manhattan. I think Pasadena and South Pasadena closed, but LAUSD’s website said they were open. It just depends on how much of the school population is Asian. Because if the kids don’t show up, the school district doesn’t get money from the state. 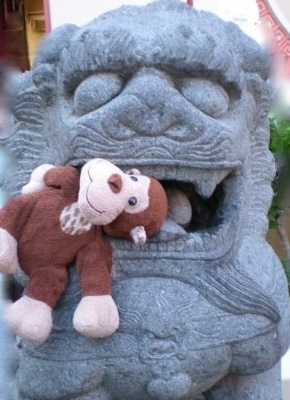 I have only seen lion dances at temple events in Taiwan, so there was no giving of red envelopes or lettuce involved. Believe me, MILs love their grandchildren because they equal bragging rights [from what I have seen anyway]. My MIL’s reaction yesterday to our news was absolutely amazing, better than I could have ever imagined. However, the story has a strange twist as well which I will explain on my blog soon. I am on the edge of my seat, Constance! Can’t wait to find out what happened. And thanks for the lion pictures! Man that dim sum sounds really good right about now. 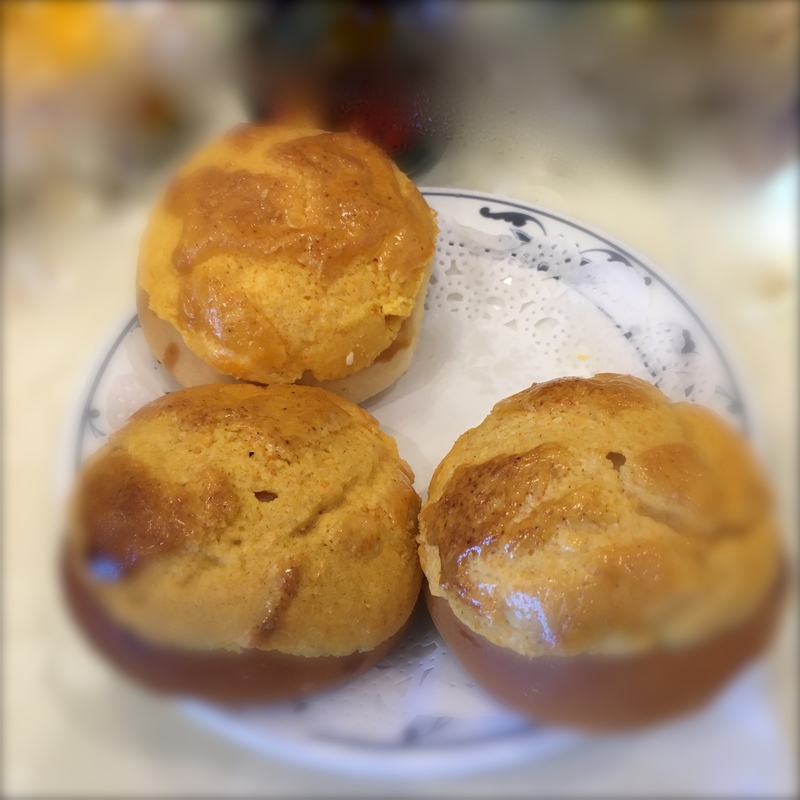 Mmmm… Monterey Park dim sum… I love the “dan tan” egg tarts! They’re a classic. Nai Wong is good too. Even after four years in China Is till don’t like chicken feet. There’s no meat on it! It’s totally not worth it. Right. Cartilage is not my thing. No chicken feet until the famine. I love the story about the kung fu extortion. I suspect you’re right about it being a practice from the past … although you never know. Those nai wong bao look delicious. My youngest daughter insists on egg custard tarts when we go for dim sum. I like the fried sesame balls stuffed with red bean paste. The fried sesame balls are jin duei! You have good taste. Those were my favorites. Until I discovered nai wong bao. My sister-in-law is getting ready to have their 4th kid. Yeah, I’m sooooo off the hook for having kids. It’s awesome. Oh, good Lord, that’s a lot of kids. Does your mom help out? She’s in Hawaii and they are in Tennessee. She helps when she can. She would love to be closer to the kids, but alas, it does not always work out that way. But I be those kids live for vacations in Hawaii with grandma! The lettuce was involved in the lion dance during Chinese New Year because, in Cantonese, the term for lettuce sounds similar to growing wealth. Chinese who celecbrate Chinese New Year want to say things positive in order to bring in good luck. Thank you, David! I appreciate the information. And also when someone doesn’t make up kung fu gansta myths to mess with white people like me. DID YOU HEAR THAT, ANDY?! What they said about some Kung Fu gangsters doing lion dance was true to a certain extent in the old days. In the distant past, some students in certain Kung Fu schools might be gang members, but they were the minority and did not control the schools. Nowadays, the student body of Kung Fu schools is clean (not gang members), drawn to the schools primarily for their love of martial arts. BTW, lion dancing is not used as a mean of extortion. The store owner gives red-pocket money to the lion dancers for two primary reasons. First, in order to thank the lion dancers for doing the lion dance (the lion dance performed during Chinese New Year is supposed to bring good luck to the store). Chinese typically would give a red pocket during New Year if somebody has done something nice for them. Second, the store owner gives the red pocket in order to not lose face (the owners of adjacent stores would have given red pockets to the lion dancers). In some instances, the lion dancing teams were actually invited by store owners who banded together to spruce up the festive atmosphere for Chinese New Year. The reason lion dance is not used for extortion is that the lion dancing team is too big and obvious a target should the police wants to crack down on it. 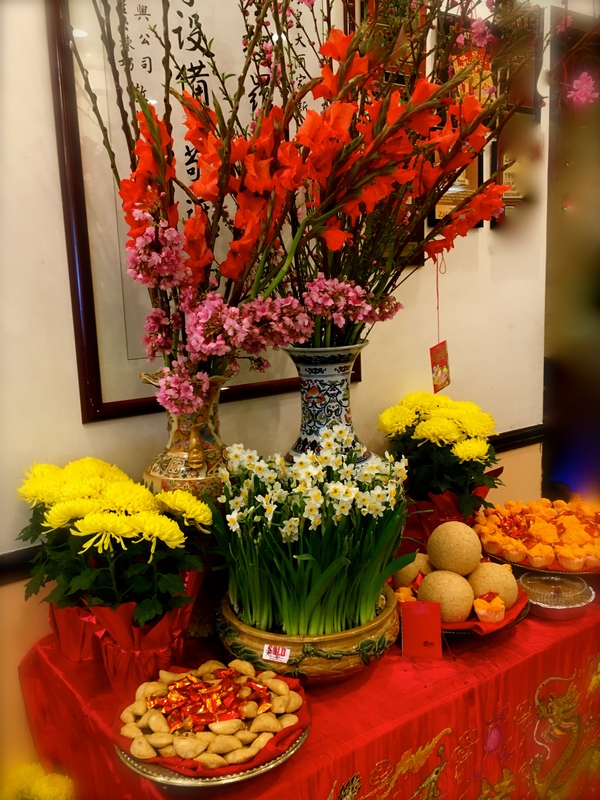 Extortion, if done, around Chinese New Year is typically performed by gangsters who would bring, uninvited, a pot of flowers to a store and leave the pot there. The gangster would pretend to wish the store owner good luck. The store owner would typically give them some money, or else the gangsters might tell their colleagues to vandalize the store later. Bringing a pot of flowers is much less conspicuous than doing a lion dance. Gangsters are smart people too. Oh, this is fascinating stuff! Ostentatious dancers versus innocuous plant. Very clever. Thank you for sharing. I am going to hoard this information and surprise my in-laws with my knowledge next year. Cousin Freddy will not be able to put one over on me again.